Patrick Kennedy, Non-executive Chairman of CarTrawler, Deputy Governor of the Bank of Ireland Group and former CEO of Paddy Power plc, joined the Pinnacle Programme to discuss his experience and the lessons learned throughout his career building significant shareholder value in the businesses he has been involved in. Between 2006-2015, Patrick turned bookmaker Paddy Power into one of Ireland’s most dynamic and successful companies. Under his stewardship, the company more than tripled its staff from 1,300 to over 5,000 and turned into a billion-euro business. He oversaw its international expansion and the explosion in the online and mobile markets, flipping the revenue model from 80% Ireland and 80% retail to 80% international and 80% online. Patrick spoke in candid detail about his ten years of experience in Paddy Power, some of the issues they grappled with and the lessons he learned along the way. 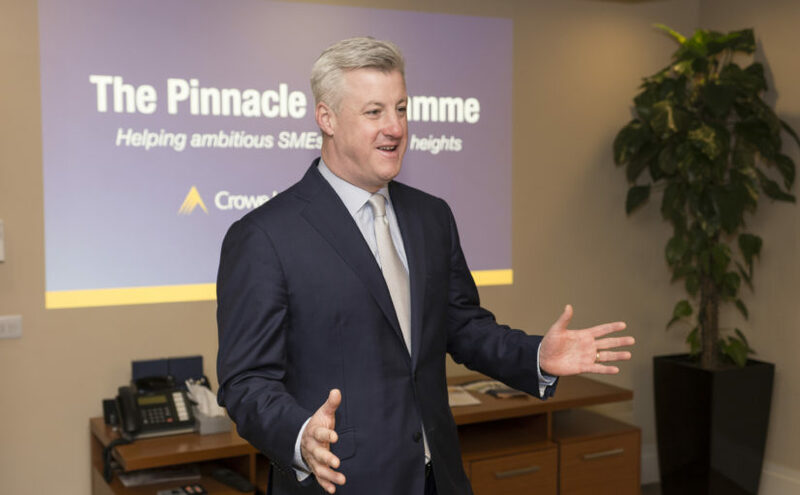 Crowe partner Gerard O’Reilly also spoke, outlining the eight key drivers of business value for SMEs. Gerard provides a programme called the Business Value Builder for business owners aimed at identifying opportunities to build and maintain lasting value in businesses. If you would like to find more about how you can recognise, build and protect value in your business contact Gerard O’Reilly or a member of the Business Value Builder team. Crowe Ireland is a member of Crowe Global, a Swiss verein. Each member firm of Crowe Global is a separate and independent legal entity. Crowe Ireland and its affiliates are not responsible or liable for any acts or omissions of Crowe Global or any other member of Crowe Global. This website does not purport to give tax or legal advice, and should not be construed as such. While we have endeavoured to verify the accuracy of the contents of this website, we do not accept any legal responsibility for any particular statement therein. Please let us know your preferences to receive Crowe updates.